I have just enough time this morning to scratch out a brief note about icdiff. We went through a lot of diff variants over the summer, and for every one of those there was probably a colorizing tool that could pick up the visual slack. That might be the strongest point for icdiff: that fact that you get most of the best features of conventional tools like diff proper, plus a healthy degree of control available in tertiary colorizing tools. I have two screenshots there because it might be important to you to know that, by default, icdiff is going to abbreviate its output to show changed areas and their context. This took me a minute to figure out, since my original file had 52 lines or so, but icdiff kept showing a much shorter output. The --whole-file flag is what controls that, and there are quite a few other options worth mention. icdiff has a built-in head feature that constrains the input to the first x lines of each file, which may be useful as opposed to piping both files through head before handing them to icdiff. Another point that might interest you is the --highlight flag, which colorizes the background field instead of the character shape itself. The author suggests it’s ugly but fast; it caught my attention because it was much easier to spot single-character changes with this. 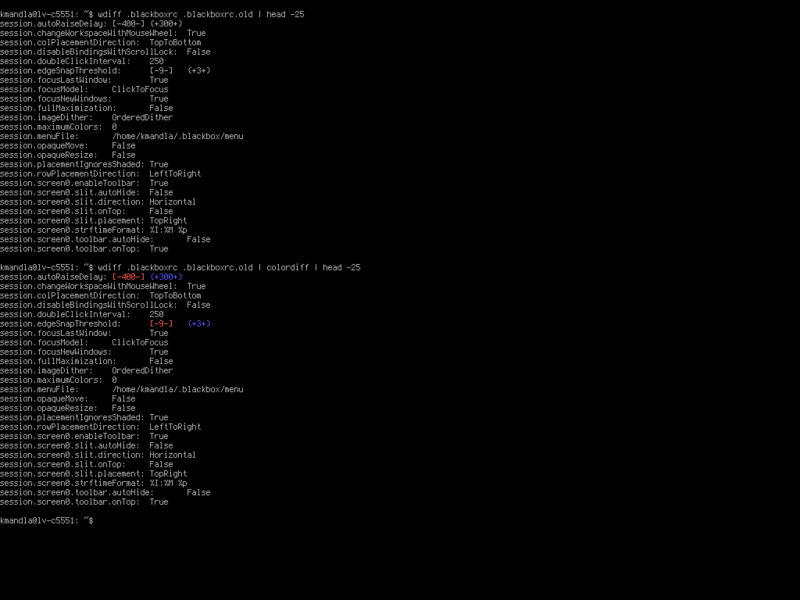 icdiff is in AUR, but I didn’t find it in Debian. Users of either distro (or others) should be able to get it working from its git repo though, so feel free to try it out. icdiff is a decent tool with some good features and might be more accessible to casual users — like myself — as opposed to the classic diff or simpler attempts to colorize it. It’s rare that I need a diff tool but I can see where this one would come in handy. This entry was posted in Linux and tagged code, color, colorize, compare, diff, difference, text, word on 2015/01/15 by K.Mandla. 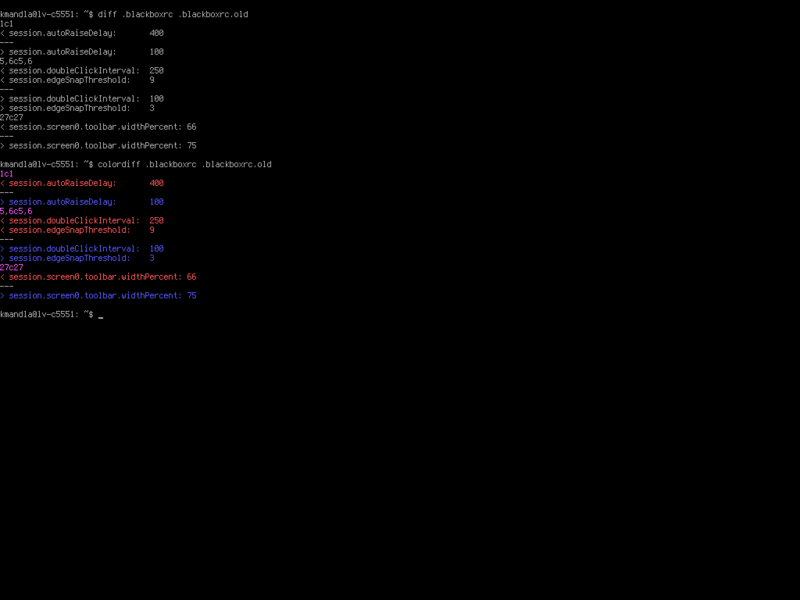 I just mentioned colordiff, but left out one thing it can do: colorize the output of wdiff. And what is wdiff, you say? That should give you an idea. 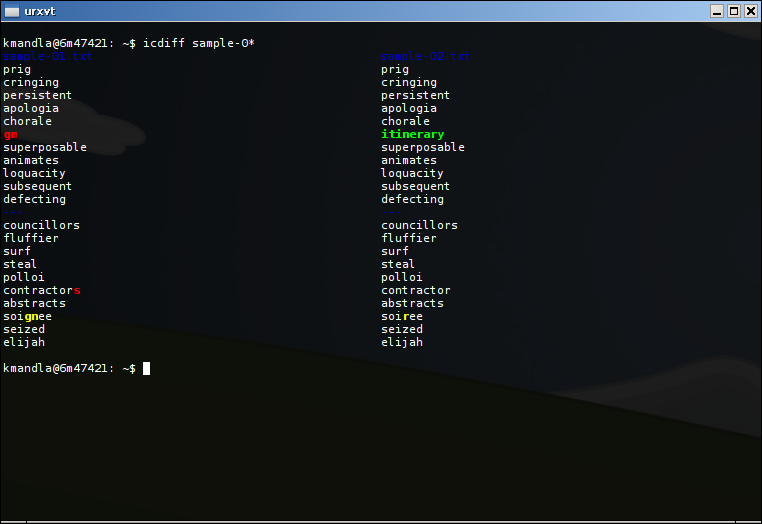 wdiff works in the same way as diff, but at a word-by-word level. If you look closely in the upper half of that image, the differences in lines of text are offset with brackets and curly braces. That may be enough for you, but you have to admit that the second half, where the output was piped through colordiff, is much easier to scan. The man page says you should add -n to wdiff before sending it through colordiff, but as you can see there, it worked fine in that example. 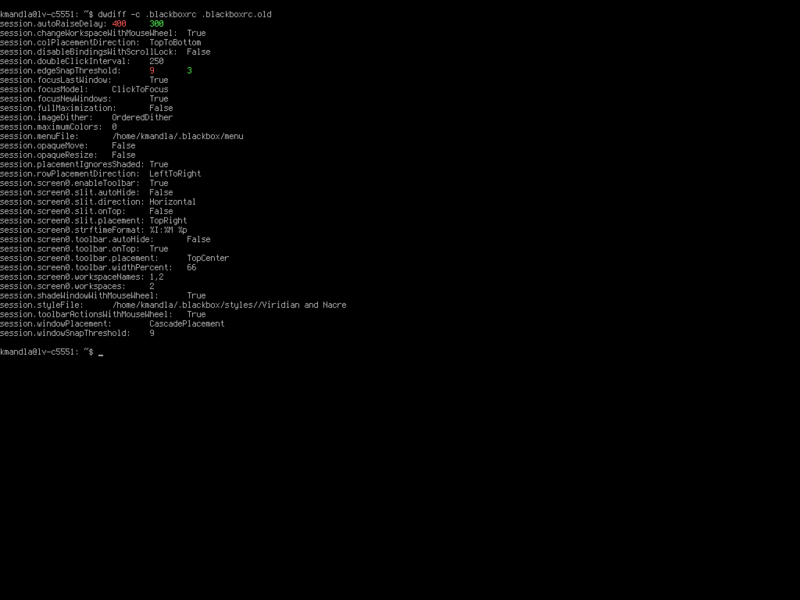 wdiff works well with colordiff, but you might prefer cwdiff, as opposed to piping things through one another. 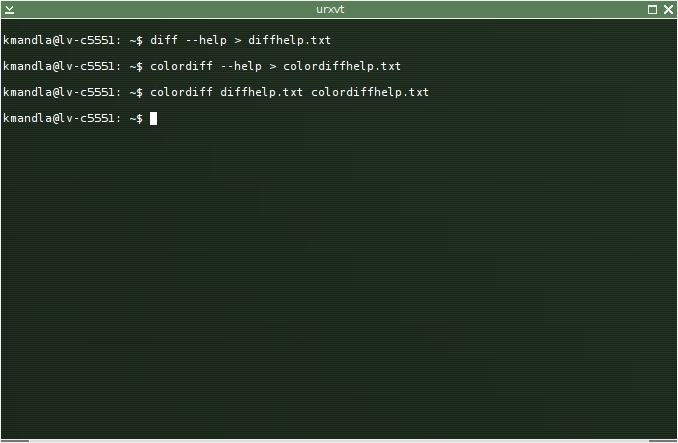 cwdiff does much of what wdiff + colordiff offers, and simplifies the process quite a bit. There are a few added options too, including one to subtract the color from the output — meaning you get pretty much what wdiff had originally. dwdiff is the last on the list that I feel obligated to mention at this point. By now, you’ll probably feel like dwdiff doesn’t really do anything that wdiff, colordiff, cwdiff or even just diff could handle. 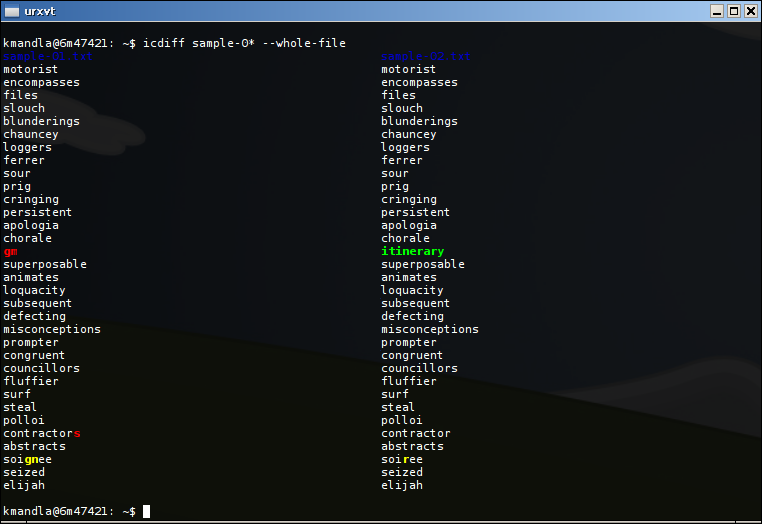 dwdiff also plucks out differences between words of files, and has a -c flag to inject color into the output. The distinguishing point between dwdiff and the others, as I see it, is its ability to set specific delimiters while searching. I couldn’t think of a good case example for that, and I searched around in hopes of finding something to test it. Nothing handy appeared though, and most examples for dwdiff seemed to generate the same output as wdiff alone or cwdiff might get you. So the final questions become academic: First, do you want colorized output (say yes! say yes! ); and second, do you need control over specific delimiters when comparing files? If you answer yes to the first, cwdiff might be the best tool, although you can get the same results from wdiff alone if you have colordiff available. If you answer yes to the second, you’ll most likely want dwdiff regardless of your preference for color. This entry was posted in Linux and tagged code, color, colorize, compare, diff, difference, text, word on 2014/07/28 by K.Mandla. Remember my unnatural predilection for anything in color? You have to admit I’m right on this point. After all, which would you rather look at? At the top, diff. At the bottom, colordiff. The choice should be an easy one. 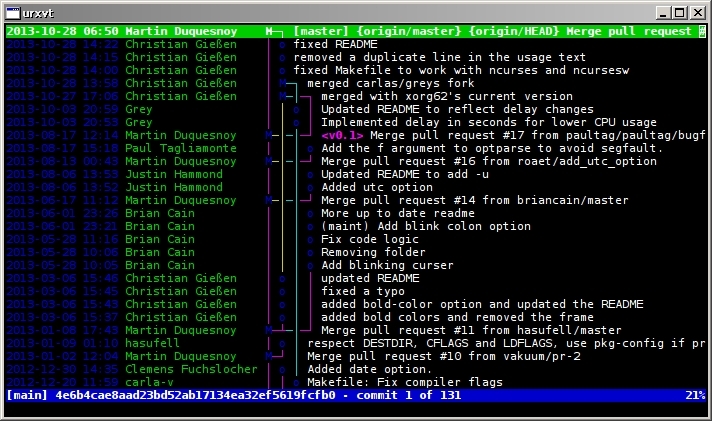 colordiff has its own rc file, installed by default at /etc/colordiff in the Arch version. 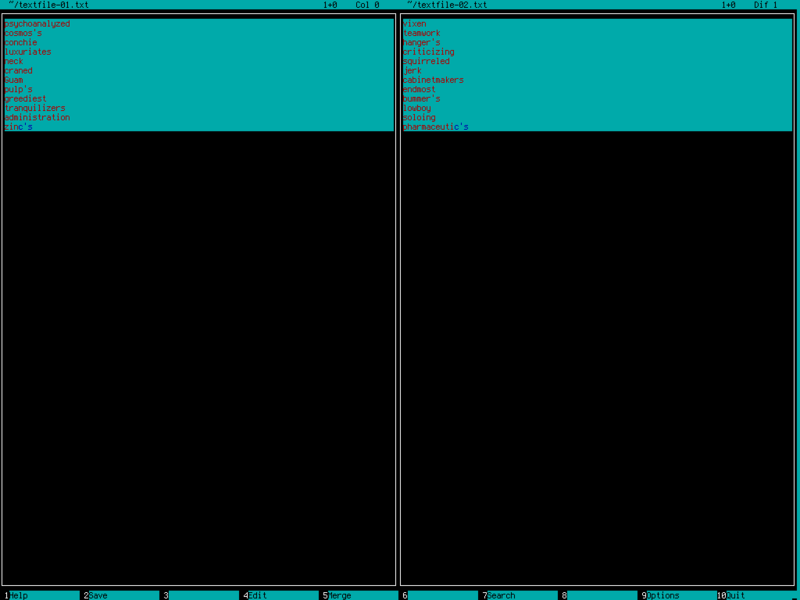 I would advise you to copy that into .colordiffrc, and customize the colors there, but if you’re just one of those weirdos who runs a black-on-white terminal emulator, you’d do just as well to copy /etc/colordiff-lightbg into your .colordiffrc file instead. This entry was posted in Linux and tagged code, color, colorize, compare, diff, difference, text on 2014/07/28 by K.Mandla. 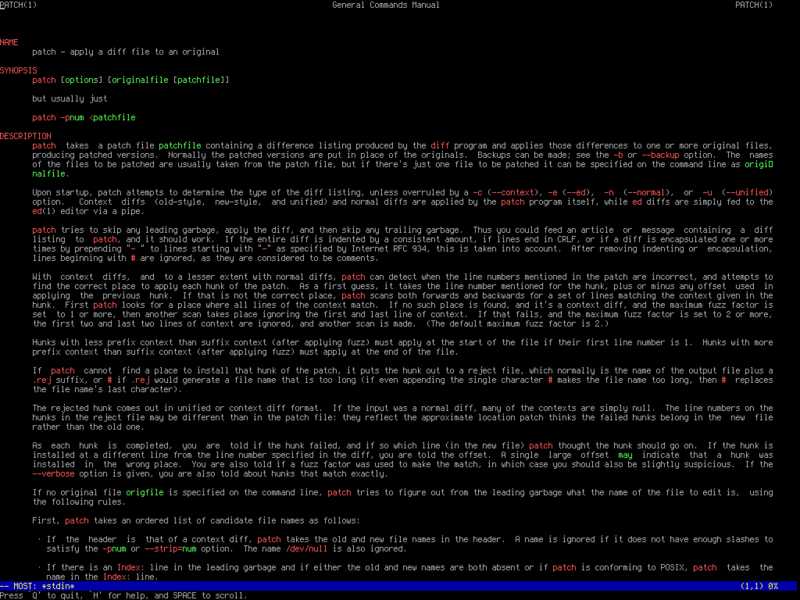 I have to give high marks to tig, a text-mode interface for git, even if I may never, ever, in this life or the next, have the chance to really put it to use. That’s just lovely. Color everywhere. Line-drawn characters showing connections between revisions. Breakout panels for examining code in detail. Line-by-line color coordination for easy viewing. Intuitive controls. Left-and-right panning, as well as scrolling. Onboard help screens. One-key jump to $EDITOR. The list goes on. tig is like my dream application. It’s as if someone read through every post I’d made for the past eight years and distilled it into one program. 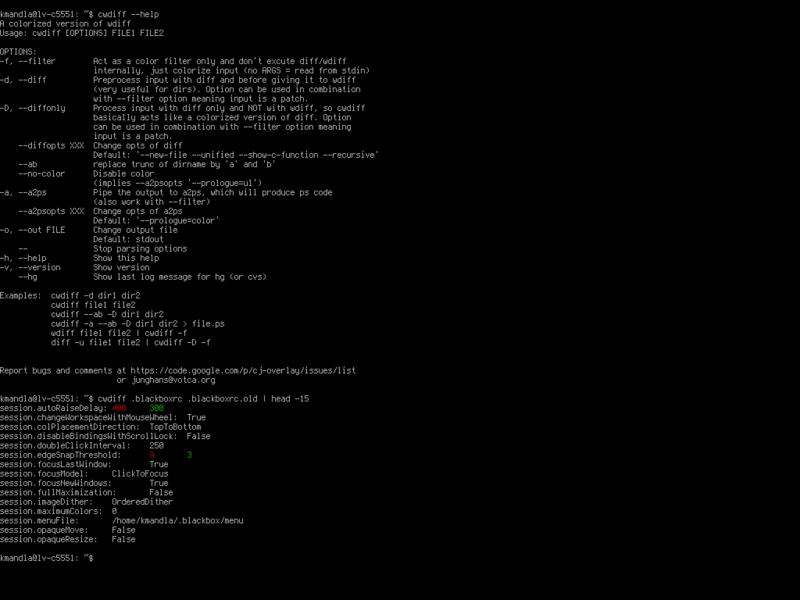 This entry was posted in Linux and tagged code, diff, git, view on 2014/05/30 by K.Mandla. I’m a little timid about mentioning patch, mostly because I have a feeling that there are literally thousands of people who know patch a lot better than me. I’ll spare you the action-packed screenshot this time, since I can’t really patch anything without both target code and a viable patch to use. My earliest run-ins with patch, aside from blind and wild swings while using Ubuntu, were while tinkering with Crux ports, years ago. 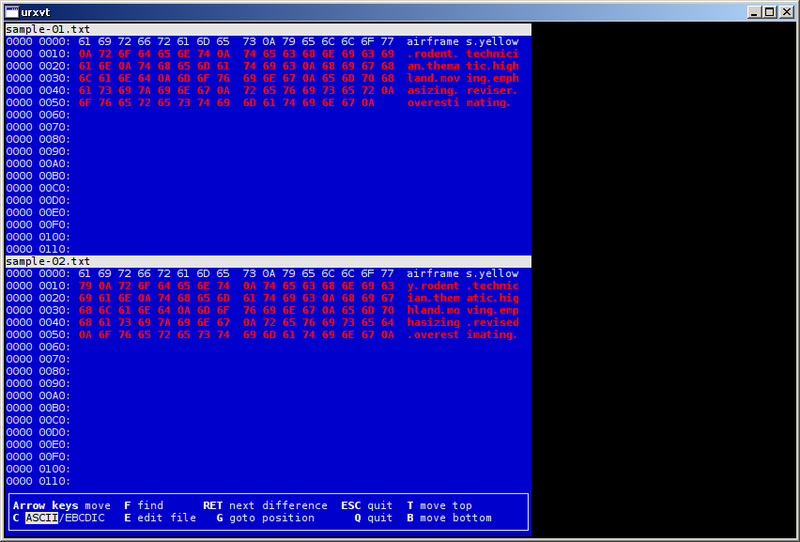 These days I occasionally have to fine-tune an errant PKGBUILD with patch, but that’s the exception and not the rule. So my experience with patch is very superficial and I won’t embarrass myself by throwing out random suggestions. Especially when I am sure there are many verified experts hovering on the fringe, ready to answer questions. patch is obliquely related to diff, which we looked over a long time ago. In Arch though, patch lives in its own package (named patch, as you might expect 🙄 ). In Debian? Wouldn’t you know it, patch is in patch. This entry was posted in Linux and tagged code, diff, patch, update on 2014/02/24 by K.Mandla. I can’t mention mc without pointing out that at least three of its internal tools — a diff’er, an editor and a viewer — are accessible without actually starting mc straightaway. As far as I can tell, these are mirror images of what you get when you cue the tools from within mc. And as you can see, they all follow mc’s general look and feel. I am not a huge fan of any of those sub-programs, but I will admit I use the viewer frequently, if I’m already in Midnight Commander. For most other uses, I rely on vim, diff and most, depending. This entry was posted in Linux and tagged diff, editor, file, pager, viewer on 2014/01/05 by K.Mandla.